Ashtead Technology has expanded its equipment rental pool following a significant investment in the latest pulsed eddy current (PEC) technology to deliver faster, more accurate asset integrity inspections. 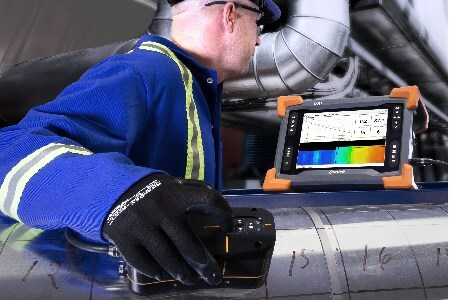 A global leader in marine technology, non-destructive testing and subsea services, Ashtead will now supply the Eddyfi Lyft™, an inspection tool for identifying corrosion under insulation (CUI), a major asset integrity issue for the oil and gas, and petrochemical sectors. CUI is a type of corrosion that occurs as a result of a moisture build-up on the external surface of insulated equipment. The corrosion is most commonly galvanic, chloride, acidic or alkaline, and if undetected, the consequences can lead to the shutdown of a process unit or an entire facility. Lyft can be used to accurately measure corrosion and wall thickness on insulated pipes without the need to remove insulation, significantly reducing time and costs. It’s suitable for use on a number of materials including metal, aluminium, stainless steel and galvanised steel weather jackets, to provide real time C-scan imaging, wall thickness measurements and fast data acquisition (up to 15 readings per sec.). Headquartered in Québec (Canada) with offices in France, the US and the UAE, Eddyfi focuses on offering high performance eddy current and electromagnetic solutions for the inspection of critical components and assets.